Choose the “allow email from Kris@DaycareHotline.com” option. To make sure email gets delivered to your inbox, you must add the email address Kris@DaycareHotline.com to your contacts list. Click the “Add Kris Murray to Contacts List” from the list that appears. You will now see Kris Murray appear under the “Quick Contacts” list on the left side of the page. Fill in Kris@DaycareHotline.com as the email address of the sender. Click on the[Save Address] link at the top of this message (it’s next to From Address). If is filtered, from the spambox, click on the white “W” icon on the left column of the mailing. When the pop-up window comes up, simply click the Add to Whitelist button. Add: Kris@DaycareHotline.com to the bottom of your existing list. Select it Click the ‘Move to Inbox and Mark as Not Spam’ button. Type: Kris@DaycareHotline.com on a line by itself in the entry field. 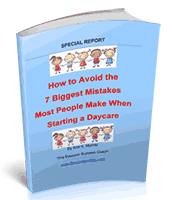 If is being filtered, try adding Kris@DaycareHotline.com to your Address Book or Contact list. If messages continue to be sent to your junk folder contact your ISP or spam filter application support and ask how to whitelist Kris@DaycareHotline.com.